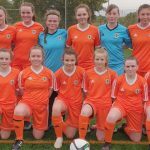 Not only did Saturday’s 4-1 win see Cliftonville even up an historic score with Ards, it also heralded another round of notable statistical milestones. 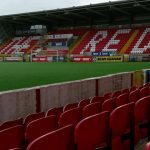 The weekend’s clash was the Club’s 290th meeting with Ards, whose record of 120 wins compared to the Reds’ 119 has now been levelled – however Cliftonville’s failure to triumph by the 61 strikes necessary to cancel out the visitors’ goal difference advantage means Ards still lead the way with 577 in contrast to our 519. Second-half substitute Stephen Garrett, meanwhile, emerged from the bench to make his 350th Cliftonville appearance, while the man who sets a new landmark every time he scores, Joe Gormley, extended his goal tally to 182 in 264 outings, a remarkable ratio that means he finds the net more than once every one-and-a-half games. 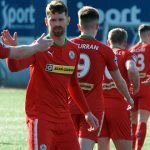 Rory Donnelly’s neat finish to make it 3-1 was the Reds’ 50th Danske Bank Premiership strike of the season and contributed to a partly-unwanted record of our games generating more League goals than any other team’s – with 96 having now been scored in just 24 fixtures at a rate of four-per-match. 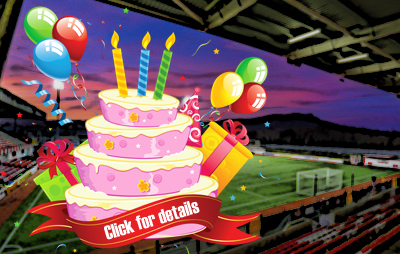 Statistically-speaking, that means there’s every chance of the 100th goal of our Premiership campaign coming in this Saturday’s clash with Dungannon Swifts at Stangmore Park, where more than one Cliftonville player could edge themselves closer to our next appearance milestone.